Greek Catholic Theological Academy [Греко-католицька богословська академія; Hreko-katolytska bohoslovska akademiia; aka Ukrainian Theological Academy]. The academy was founded in Lviv in 1928 by Metropolitan Andrei Sheptytsky to foster theological studies with particular emphasis on the liturgical and other particularities of the Eastern rite, the history of the union of the Ukrainian church with Rome, and Eastern dogma. It was also a school of higher education for candidates to the priesthood. The academy was intended to serve as the embryo of a future Ukrainian university. Organized on the same principles as Catholic universities in the West, it offered a five-year program. It had faculties of philosophy and theology, and a law faculty was to have been established in fall 1939. There were 350–400 students between 1932 and 1939, with 50–70 graduating each year, and a teaching staff of about 30 professors and lecturers. Ukrainian and Latin were the languages of instruction. The academy was directed by a rector appointed by the metropolitan from among the full professors. For the entire period of its existence the rector was Rev (later metropolitan and cardinal) Yosyf Slipy. Altogether the academy published 21 volumes of works. The history seminar published (irregularly) its Arkhiv Seminara istoriï; the Slavic philology seminar, the semiannual Slovo; and the art history seminar, the quarterly Mystetsvo i kul'tura. The academy maintained a library and a museum (est 1932) with icons from the 14th to the 16th centuries. Scholars such as Metropolitan Andrei Sheptytsky, Bishop Mykola Charnetsky, reverends Yosyf Slipy, Tyt Myshkovsky, Vasyl Laba, Dionysii Dorozhinsky, Yaroslav Levytsky, Mykola Konrad, Andrei Ishchak, and Yuliian Dzerovych, and laymen Mykola Chubaty, Ivan Krypiakevych, Yaroslav Pasternak, Yurii Poliansky, Konstantyn Chekhovych, Volodymyr R. Zalozetsky-Sas, and Borys Kudryk served on its faculty. The academy was closed by the Soviet authorities in 1939 and again in 1944. From 1941 to 1944 it had an enrollment of 97 students. When Metropolitan Yosyf Slipy came to the West in 1963 he founded the Ukrainian Catholic University in Rome and re-established the academy as its faculty of theology. 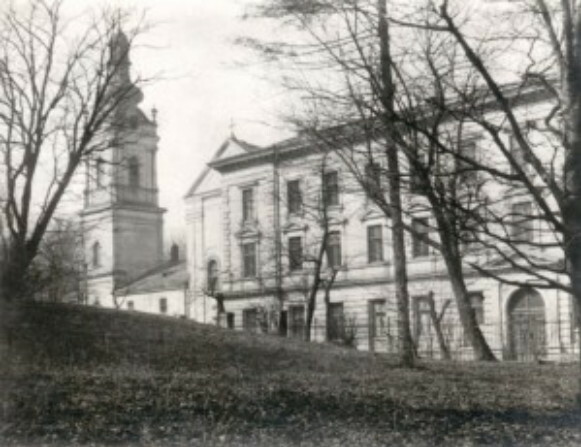 In 1994 the Lviv Theological Academy was formed as a successor to the Greek Catholic Theological Academy. In 2002 it was reorganized as the Ukrainian Catholic University.